He can knock spiders right off the wall. Knock lamps right off the table. Teeth right out of your mouth. Strangely, while he can do most of the usual tricks, he still struggles with “Walk the Dog”, a basic sleeper. 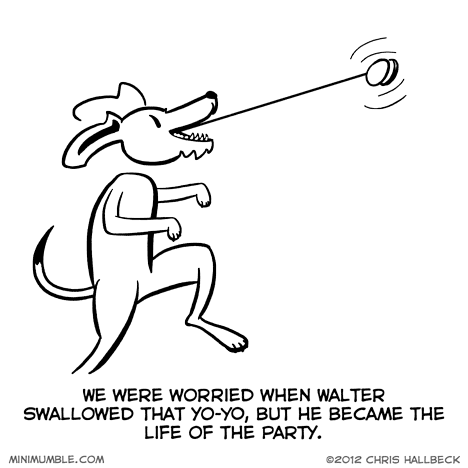 Unfortunately I missed everything because I left the party once I noticed that Walter was transforming into a werewolf. It’s disappointing because, yo-yo mastery aside, I was looking forward to seeing his dance moves and I heard they were playing Thriller later on that evening. Yo, dawg, we put yo’ yo-yo in yo dog so yo’ dog can Walk the Dog while yo’ walk the dog!